Adam Sandler, Ben Stiller, and Dustin Hoffman deliver some of the finest award worthy performances of the year in Noah Baumbach's new feature film. 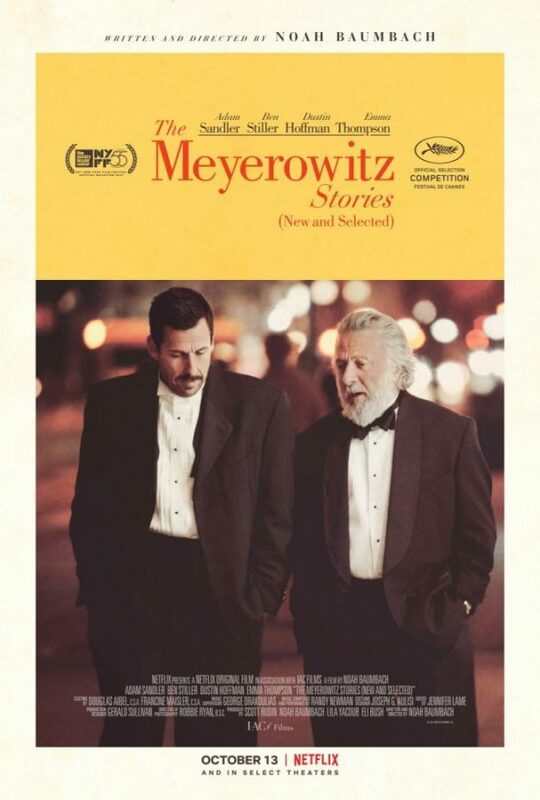 Official movie poster for, "The Meyerowitz Stories (New and Selected)", produced by Gilded Halfwing, IAC Films, and distributed by Netflix. The dysfunctional Meyerowitz family reunites after years without contact in celebration of their father’s artistic work in Noah Baumbach’s (The Squid and the Whale) new feature film distributed by Netflix, The Meyerowitz Stories (New and Selected). After Adam Sandler’s Golden Globe nominated breakthrough performance in Paul Thomas Anderson’s 2002 indie darling, Punch-Drunk Love, nobody could have thought (including myself) that Sandler would ever live up to such a performance, let alone exceed it, until now. Adam Sandler is absolutely sensational in The Meyerowitz Stories; from the little character nuances, line delivery, to the way he interacts with the set, Sandler delivers a flawless, fully realized performance. Sandler is not only better than he normally is here but, may have given one of, if not, the best male lead performance of the year so far. Sandler is simply mesmerizing from start-to-finish; as are his co-stars, Ben Stiller and Dustin Hoffman. Stiller gives the best performance of his career and Hoffman certainly gives his best performance in years. All around the board, the acting in The Meyerowitz Stories is a tour de force and should be praised. Between the stellar performances and the Palme d’Or nomination at Cannes, Academy Award chances are pretty hopeful. The writing and directing from Baumbach is not only some of the best of his career but, of the entire year. Scenes are blocked so precisely and realistically with characters talking over one another and moving in such an authentic and genuine way, you can’t help but acknowledge and appreciate the sincere effort that went into making the film feel so realistically grounded and genuinely human. It’s simply masterful filmmaking. The true highlight of the film however, have to be the marvelous character interactions between the eccentric family members. Adam Sandler and Ben Stiller have such a believable sibling camaraderie with one another you can’t help but flock to the screen with bug eyes transfixed by their pitch perfect chemistry. Dustin Hoffman dominates the screen with his overbearing presence, which is both engaging and frightening at the same time. The negligence and self-centered ego he has towards his children is sickening, yet mesmerizing, and makes for some tense and thrilling sequences throughout. The supporting cast, from Elizabeth Marvel to Grace Van Patten, is astounding as well. A film this well written, acted, and directed, it’s hard to see how anyone could find anything displeasing. With only one minor complaint, that being the seemingly rushed final ten minutes or so, I can honestly say, The Meyerowitz Stories (New and Selected) is one of the very best films of the year and a must watch! An extremely enthusiastic and well-deserved 4.5/5 (9/10)!